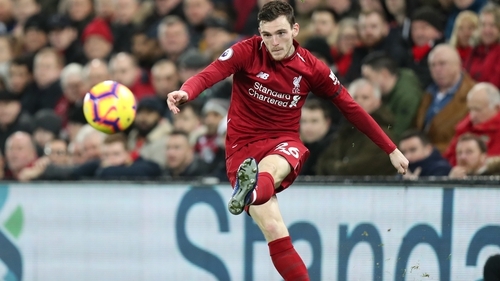 Andy Robertson feels Liverpool head into the international break on the back of "a massive week" as they remain in the hunt for a Champions League and Premier League double. Facing relegation-threatened sides Fulham and Burnley over the past two weekends, Liverpool could easily have fallen behind in the title race. "It gets to this point in the season where people are fighting for their lives from relegation, and that's so tough," said Robertson. "People are fighting for European spots and positions and trying to get in the top 10 and stuff. "It's very rare that teams aren't playing for anything at this time of the season so people start fighting and giving it their all. Luckily, we had enough in the tank. "(It was) a massive week for us. Obviously beating Burnley at home was difficult, as they are in a similar position to Fulham, and we fell behind there. "Bayern speaks for itself, and then it was all about trying to get our legs ready and go again and go flying into the international break top of the league, and luckily enough we have done that." The defeat for Fulham was their third in succession since caretaker manager Scott Parker took charge, leaving the club 13 points adrift of safety and staring at near-certain relegation back to the Championship a year after they were promoted via the play-offs. Midfielder Tom Cairney believes that despite the results under Parker there has been an improvement. "The manager has only been in charge a couple of weeks, and I think you can see the turnaround in performances already," Cairney said. "There is a better atmosphere around the club but obviously, we need results. "There is a better atmosphere, a better vibe around the training ground. It's looking like we might not stay up, the points difference is massive and we are running out of games. "I think there is a bigger picture and we have just got to build. It's not the season we dreamed of in pre-season but this is football and these things happen. "I think the club has lost a little bit of what we had last season. It's mad how quickly things can change. "For a number of reasons it didn't go right. We spent a lot of money and stuff. The Premier League is tough, it's the best league in the world for a reason and we are finding that out the hard way."